If you are planning on getting a puppy, and you are wondering about how to properly care for it, one of your first considerations should be his diet. Puppies need different types and amounts of nutrients than adult dogs, because they are growing and developing. This is why it is so important to make sure that you feed him kibble that has been specifically designed with the needs of a growing puppy in mind. Today we are going to take a look at five of our favorite puppy foods, as well as provide information about proper puppy nutrition. Let’s get started. When should I switch from puppy food to adult dog food? How long should I feed my dog puppy food? Can you feed a puppy regular dog food? When can puppies start eating dry kibble? Dogs of all ages love the taste of real meat, and they particularly love the taste of wild meat. 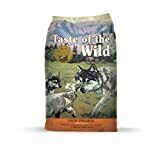 Taste of the Wild Natural Dry Dog Food is made with real, roasted bison and venison, and real meat is the number one ingredient. This is a great choice for building strong, lean muscles. Taste of the Wild is actually made with real, wild meat. With meat as the number one ingredient, you can be sure your puppy is getting the important amino acid profile, as well as protein, which is going to help their muscles to grow and develop properly. This kibble also contains superfoods that provide natural antioxidants, as well as DHA for brain and vision development. This is a high-protein recipe, and the kibble is smaller, making it ideal for small breed dogs. It is rich in nutrients, very digestible, and contains proprietary probiotics that are breed-specific. It contains no grain, corn, or wheat filler, and no artificial flavors, colors, and preservatives. Even though your puppy comes from a long line of domesticated dogs, it still shares the DNA of its ancestor, the wolf. So, they need to have the same nutrients that wolves would eat, and that is what you will find in this grain-free kibble. 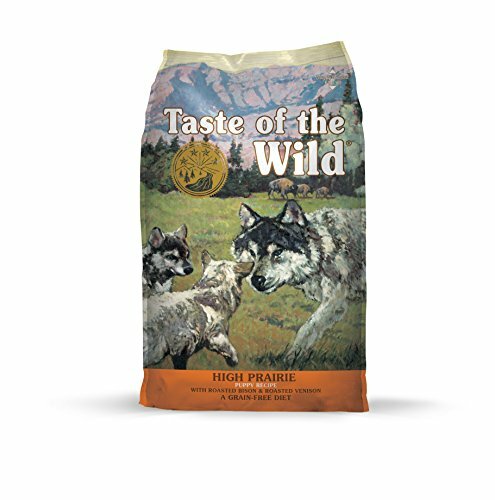 Unlike other varieties of puppy food, Taste of the Wild actually contains real fruits and vegetables that are rich in antioxidants. You can’t always be sure of the meat sources with this kibble. Yes, it does say that natural, wild meats are used, but these are not always locally sourced. Some dogs have experienced digestive issues with this dog food. 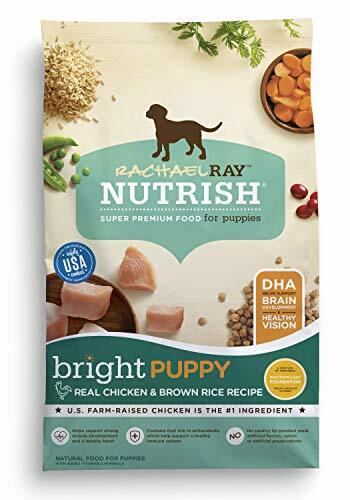 Rachael Ray Nutrish Bright Puppy Food is made with US farm-raised chicken as the number on ingredient. It contains DHA to help support healthy brain and vision development, and is rich in antioxidants that comes from natural fruit sources. It contains no poultry by-product meal, or artificial flavors or colors. This is a natural food for growing puppies that contains added vitamins and minerals that your puppy needs. Inspired by real recipes from Rachael Ray’s own kitchen, these foods are made with love, as well as wholesome and healthy ingredients. Dogs do love the taste of real meat, which is why they tend to love this kibble, as it is made with real chicken as the number one ingredient. This is a quality protein that puppies need to develop healthy muscles and organs. This puppy food also aids in the development of the brain and eyes, thanks to DHA from fish meal. It is also rich in B vitamins, carbohydrates, and fiber from brown rice, carrots, and peas. It also contains cranberries, which are rich in antioxidants. Some of the best ingredients include chicken, soybean meal, sunflower oil, fish oil, and dried plain beet pulp. This food is targeted at all types of puppies, but it is not the best choice for large breeds. This is because the kibble is very small, and could pose a choking hazard to larger dogs. It has also been known to cause diarrhea and other digestive issues in some dogs. Purina Pro Plan Focus for large breed puppies is made with high-quality protein, with real chicken being the number one ingredient. Each ingredient in this puppy formula is carefully selected because of its nutritional properties, including fish oil for DHA which helps to encourage healthy brain and vision development. This kibble contains phosphorus, calcium, and other minerals that promote the growth of strong, healthy bones and teeth. It contains quality, natural ingredients, including chicken, lamb, or salmon as the first ingredient. 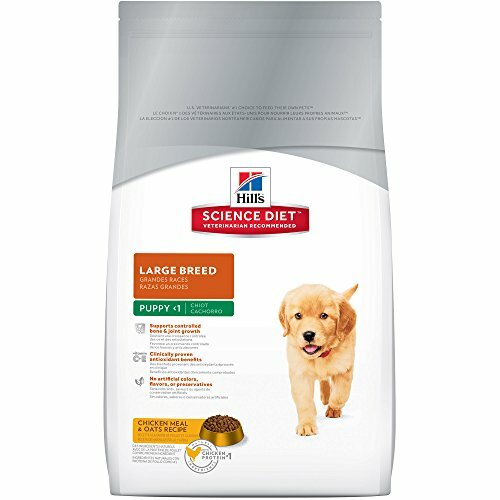 This is specialized nutrition for your large breed puppy. Each ingredient in this kibble is chosen for a purpose, ensuring that your puppy is going to have all of the nutrients they need to grow up strong and healthy. This Large Breed Chicken & Rice Formula dry puppy food is just right for dogs that are going to grow to be 50 pounds or larger. Ordering dog food online can be a problem, because you can’t always be sure that you are going to receive the product intact, due to problems in shipping. It may also be expired, and not have the best smell or flavor. 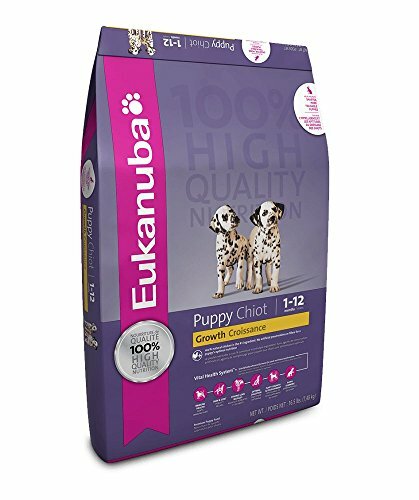 Eukanuba Puppy Dry Dog Food has clinically proven DHA levels from natural fish oil to help promote brain health, which will help to make your puppy smarter and easy to train. It has a specialized fiber system that is made from natural beet pulp and prebiotic FOS to help with the absorption of nutrients and digestion. This puppy kibble is rich in antioxidants, which is important in the development of a healthy immune system. It features DHA from natural fish oil, which helps with brain health, actually making puppies more intelligent and easier to train. It also helps to promote healthy skin and coats, thanks to Omega-3 and Omega-6 fatty acids. This formula is specifically blended to help support the immune system, along with healthy digestion, and it features the 3D DentaDefense System, which helps to protect against tartar buildup on the teeth. Each time your puppy eats this kibble, he will basically be brushing his teeth. The blend of beet pulp and higher FOS than the Eukanuba Adult Maintenance kibble helps to promote good digestive health. There are loads of other nutrients that make this a very healthy food for your puppy to eat every day. There have been many issues with ordering dog food online, and the sources can sometimes be questionable. Watch out for bags that are damaged, and expired foods that may not be healthy for your pup to eat. 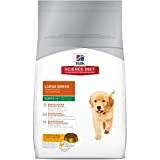 Hill’s Science Diet Chicken Meal & Oats for large breed puppies is recommended for puppies that will grow to over 55 pounds, for the first year of their lives. It contains loads of calcium for healthy bone growth in large breeds, and has natural sources of glucosamine and chondroitin. This kibble is made with many high-quality, natural ingredients that are easy for puppies to digest. It offers a good blend of antioxidants and vitamins C and E, as well as many other important vitamins and minerals. It contains no artificial colors, flavors, or preservatives. This food from Hill’s Science Diet is specifically designed for large and giant breeds, which can often have mobility issues due to their weight. The natural glucosamine and chondroitin help to keep the cartilage and knee joints healthy for an active lifestyle. Supports a healthy immune system with a clinically proven blend of antioxidants with vitamins C and E.
This dog food nourishes the skin and coat because it has loads of vitamin E, as well as the Omega-6 fatty acids, along with other key ingredients that help keep skin and fur conditioned. You should notice a huge difference in your pup’s coat within 30 days of using this product. This product has been known to cause digestive issues, including vomiting and diarrhea, in some dogs. Also, there are some dogs who may be allergic to some of the ingredients, even though they are completely natural. There are many different types of puppy food, and not all types are right for all dogs. For instance, if you have a small breed puppy, you aren’t going to want to feed him kibble for large breed puppies. Before you run out and buy any puppy food, it is important that you know what type of food to be looking for. Remember, small and large breeds grow at different rates, and the foods that are specific to size are going to have different types and amounts of nutrients. Don’t forget about moist, semi-moist, and dry foods. Each has its own specific benefits, but of the three, most experts will say that the best type for puppies is dry kibble, for several reasons. To start with, dry kibble is easier to use and a lot cheaper than moist and semi-moist foods. It is often easier for puppies to digest, and it usually contains more meat protein. Dry kibble is also better for their teeth, and helps to keep them clean. Natural food is good for dogs that may be sensitive to artificial colors, flavors, or preservatives. Keep in mind, however, that the FDA does not regulate the use of the term “natural,” except for the truth-in-labeling requirement. Therefore, it will be up to you to determine if a pet food meets your standards for what a natural dog food should be. The idea behind grain-free food is that it’s the kind of food dogs ate before becoming domesticated. Your dog’s ancestors didn’t gather grain or make bread. (Although, maybe they would have if they had had thumbs). Grain-free dog food is great for owners who want to offer their dogs a more natural diet, and for dogs who have grain sensitivities. However, if you have a small dog with a high metabolism, grain-free might not be the best. Small dogs can be prone to hypoglycemia. Consult your veterinarian as to the best dog food for your pet. Holistic pet foods are the newest comer to the market. The term holistic refers to “the big picture,” and holistic viewpoints consider a system as a whole. Some holistic pet foods contain probiotics to improve your best friend’s intestinal health. Others provide enzymes to aid in digestion. Additional holistic ingredients may include antioxidants, yogurt, and fiber. You’ll want to compare the different brands to see what is best for your pet. Limited ingredient diets are good for dogs who have allergies, or for those with sensitive stomachs. The downside to limited ingredient diets is that they may not be complete and balanced. To find a formulation that is complete, look for one that aligns with The Association of American Feed Control Officials’ (AAFCO*) guidelines. Does your pooch have itchy skin? A sensitive-skin dog food might be right for her. Sensitive skin diets tend to be formulated with skin-friendly ingredients, including omega-3 and omega-6 fatty acids. Organic foods are foods that have been grown without the use of chemical fertilizers. Organic claims are regulated by the National Organic Program within the USDA, so look for the USDA organic seal on the bag. This food is good for owners who want to limit the amount of pesticide their pet consumes. High protein diets (when combined with high fiber) have been found to help obese dogs lose weight by increasing satiety (the state of being completely full) and helping to preserve lean mass during calorie restriction. High-protein diets may also be suitable for reducing territorial aggression in some dogs. However, this type of diet has the potential to cause harm if your pet has kidney or liver issues, or if the dog food contains too many co-occurring ingredients such as bone. Raw dog food is exactly like it sounds: it hasn’t been cooked. This is probably the 2nd most controversial of the diets, with the vegetarian diet being the first. The idea behind raw food is that enzymes — which aid in digestion — are preserved. This diet also reportedly helps dogs who have skin problems, as well as dogs who have low coat quality. However, cooking food provides a serious benefit: it eliminates dangerous microorganisms. One study found that raw dog food contained Salmonella, and had more E. coli than dry dog food. Many owners feel this isn’t a problem because dogs seem to be more capable of handling bacteria than humans are. If you feel a raw diet may be right for your pet, you’ll need to do a lot of research. For example, you will need to make sure your dog doesn’t get sick from eating too much vitamin A, which is commonly found in liver. Vegetarian and vegan diets for dogs require careful planning and monitoring, even more so than human vegetarian diets. Your dog can’t tell you what his body is craving. Although this diet is controversial — opponents say dogs are meant to eat meat — the arguments against it are the same arguments that were once used against human veganism. For any vegan who has been told “you’ll die without meat,” (spoiler: you won’t) it’s understandable that many believe the controversy to be based more out of fear than fact. Vegan dog foods use pea, chickpea, rice, and other plant proteins to give dogs all the amino acids they need. You’ll need to do your research and offer plenty of variety. This type of dog food is suitable for pets who have meat allergies or sensitivities, or for pets who have vegan pet parents. Many owners say their dogs thrive on a vegan diet. Here is something that is going to come with a bit of trial and error. Not every dog likes the taste of every kind of food. It could take a while to find a food that your puppy actually enjoys eating. Look for puppy foods that are made with real meat rather than meat by-products, and that do not contain artificial ingredients or fillers that don’t taste very good. If your puppy turns his nose up at something, you will have to keep trying until you find something that they like. All dogs love the taste of real meat, so look for foods that are made with healthy ingredients such as lamb, chicken, turkey, and salmon. Now it really starts to get confusing, because there are so many different dog and puppy food brands out there. This is where you really need to start doing your research, to make sure that you find a brand that offers the best food for your pup. Some of the best puppy food brands include Purina, Eukanuba, and Hill’s Science Diet. It is a good idea to avoid no-name and other less expensive foods for your puppy. You can be pretty sure that these are not going to contain enough of the nutrients that puppies need, and they will also contain a lot of unnecessary ingredients, including artificial color and flavor. It is very important that you start reading the labels on the food you buy for your puppy, especially the ingredients. What you need to be looking for are the healthy ingredients, and you shouldn’t be seeing many, if any, of the not-so-great ingredients. For instance, puppy food should contain real chicken, turkey, lamb, salmon, beef, etc., and this should be the first ingredient as it is the protein. It can have meat meal, but this should be a secondary ingredient rather than primary. Quality puppy food will not contain corn or wheat gluten as fillers, which can actually be bad for a dog’s health. Now that you have a pretty good idea of what your pet needs, it’s time to look at food labels. The ingredients section lists ingredients in order of weight, with the first ingredient making up the largest percentage. Keep in mind, however, that some ingredients contain more water than other ingredients. A product that lists beef first may contain less protein than another product which lists cornmeal first because meat is mostly water. There are two important things you need to know about guaranteed analyses. 1) The ingredient percentages (including crude protein) between wet and dry dog foods cannot be compared without doing some math. Basically, it’s the idea that 10% of 500 is more than 30% of 100. 2) When comparing crude protein between two different wet dog foods, a small difference in moisture content can make a big difference in the protein content. Use the calculator. A cheap, plentiful source of protein is leftover animal parts from the human food industry. Poultry by-products include, well, let’s just say that in the egg industry when chicks hatch only the female chicks go on to become egg-layers. The male chicks do not go on to become meat chickens. Other by-products can include protein sources such as bones with meat scraps, hides, beaks, and connective tissue. Some by-products may be high-protein, but that doesn’t mean they’re digestible. Some manufacturers will “fix” the digestibility problem by chemically digesting the by-product. This process is called hydrolysis, and hydrolyzed products will be listed as such. The term “meal” might be a little deceptive because “meal” sounds appetizing. Unfortunately, animal meal is anything but appetizing (for humans, that is). Meal is leftover animal parts such as udders, oesophagi, lungs, brain, spinal cord, diaphragm, etc. which are cooked and then dried. Meal does not contain hide, horn, hoof, hair, blood, or manure except for that which gets included by accident. Although meat meal may not appeal to humans, it is nutritionally sound. Dogs probably don’t care about the source of their nutrients, as they aren’t as squeamish as their humans are. Our dogs probably wonder why we are always throwing away half of our “dinner” into a kitchen bin so that a truck can pick it up from our curb once a week. While it’s up to pet parents to decide if grains, meal, and by-products are right for their pet, this list contains things you should avoid. Some of these chemicals are known carcinogens and are unsafe for humans. Food dyes aren’t necessary, anyway. In fact, dogs can’t even see the color red. Until your puppy has reached their full growth and development, it is a good idea to keep feeding them puppy food. There are different nutrients in puppy food that are necessary for healthy growth and development, and they may or may not be present in all types of adult dog food. Puppy food is essential for all stages of growth in the first one to two years of a dog’s life. The length of time that you feed your dog puppy food often depends on the breed. For instance, if you have a large breed puppy, it will have a longer growth cycle than a smaller breed. Small breeds, such as Yorkies and Chihuahuas, reach physical maturity by the time they are 10 months old or so. On the other hand, large and giant breeds can take up to two years to reach maturity. When they reach maturity, it is then time to change their food, and their feeding schedule (fewer feedings per day). A lot of people don’t realize that the nutritional benefits are different in puppy and adult dog foods, and they end up feeding adult food to their puppies that don’t meet their nutritional needs. If it is absolutely necessary, it is not going to be dangerous to give your puppy adult dog food. But, it is not a good idea to have them on a steady diet of adult dog food. The formulations in puppy food are specifically balanced to ensure that there is the proper amount of protein, carbohydrates, calories, fat, vitamins, minerals, and other nutrients that puppies need for proper growth and development. If you are getting a new puppy, it is time to educate yourself about dog and puppy food. It is time to start learning how to read dog food labels, and learning which ingredients are good and which are not good. But, labels can fool you, so don’t automatically believe that a puppy food is healthy because it meets the Association of American Feed Control Officials (AAFCO) requirements. You should be looking for foods that exceed the guidelines and requirements, that are meat-based (meat must be listed in the first two ingredients), that contain no chemical preservatives and fillers, etc. Talk to your veterinarian about the nutrients your puppy needs, and which type of food you should be feeding him. Once they are weaned off their mother’s milk (about three to four weeks of age) puppies should start out with puppy mash, which is a mixture of dry puppy kibble and liquid puppy milk or water. By the time they are about eight weeks old, they should be on totally dry kibble. By this time, they will be ready for you to adopt, and you can feed them strictly dry kibble, with no need to make any puppy mash. How much you feed them will depend on a few factors, including their size, breed, age, and activity level. Puppies should be fed about twice daily, preferably at the same time each day to establish a toilet routine. Bringing a new puppy into the home is a fun and exciting time, as long as you are fully prepared and know what you need to do in order to take care of all of his needs, including his nutritional needs. Any of the puppy foods we have discussed today should be great to feed to your new puppy, and will provide them with all of the nutrients they need to grow and develop properly. Of the five, we think the best puppy food is probably the Eukanuba Puppy Growth, because it is a formulation that can be given to all types of puppies, small and large. It can take time to find the right food for your dog, so don’t get discouraged by all the information. A little improvement is always better than none, so if you need to start small that’s OK.
With a little time and effort, you’ll be well on your way to finding the best dog food for your pet.